Fresh, organic produce takes centre stage for Poh Ling Yeow in her latest cookbook, Poh Bakes 100 Greats. Preheat the oven to 180°C (350°F) fan-forced. 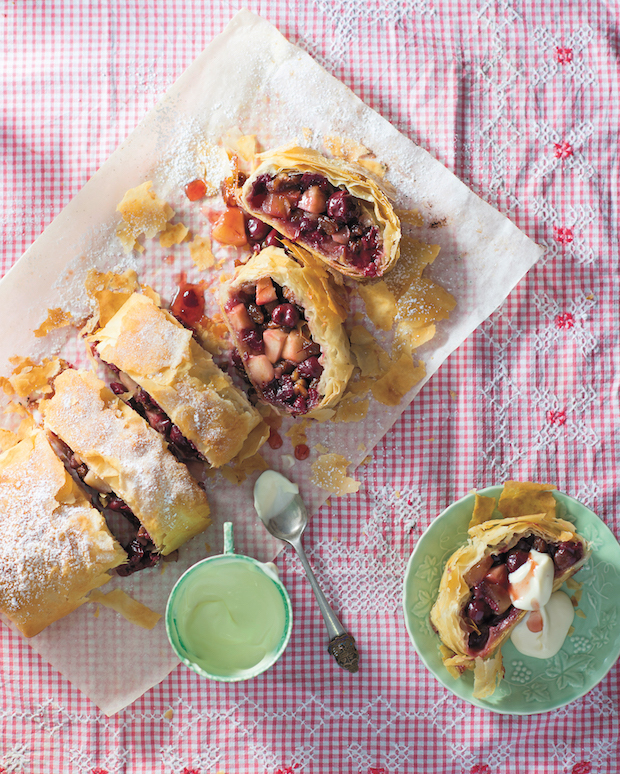 To make the strudel, lay a sheet of the filo pastry on a large baking tray lined with a sheet of baking paper, and brush with a generous amount of the melted butter. Lay another sheet on top, and repeat. Continue in this way until all the filo has been used. Set aside. Combine the apples, cherries, walnuts, currants, Frangelico, sugar, flour and cinnamon in a medium mixing bowl, and toss gently with clean hands to mix the ingredients evenly. Tip the mixture across the centre of the filo sheets, leaving a 7cm border on each side. Fold both sides inwards, then roll into a sausage to enclose the filling. If it’s a bit of a mess, unwrap the pastry, pop all the bits that have fallen out back into the centre and have another go, as the filo is fairly robust. a deep golden brown, so all the layers are cooked through. Leave to cool for at least 30 minutes before serving. Dust with icing sugar just before serving with your choice of dolloping cream. This is your most basic, most neutral-tasting cream for dolloping on desserts and decorating cakes. Make sure you don’t overwhisk this, or you will split the cream and be on your way to making butter. The only way to remedy this, unfortunately, is to start again from scratch. Combine the cream, icing sugar and lemon zest in a medium mixing bowl, and whisk by hand or with an electric mixer until medium or stiff peaks form. Medium peaks make a nicer texture to dollop and provide moisture to slices of cake. Stiff peaks are more fitting for icing cakes and piping with, as the shape stays put.